Members of the oil industry gathered at the Ector County Coliseum in Odessa, Texas, Oct. 16 to 18 for the 2018 Permian Basin International Oil Show. The event has been held every two years since World War II and is a means to showcase new technology, equipment and ideas in the industry. This year's show featured more than 700 oil and gas-related companies. The show, which continues to grow in size, welcomes a world-wide audience, making it one of the largest gatherings of members of the petroleum industry in the world. While the show features the newest strides in the oil industry, the past also is honored. According to the PBIOS website, "a working cable tool rig operates daily on the show grounds and is surrounded by trucks and oil field equipment from the 1930s", to showcase the growth and importance of the Permian Basin. 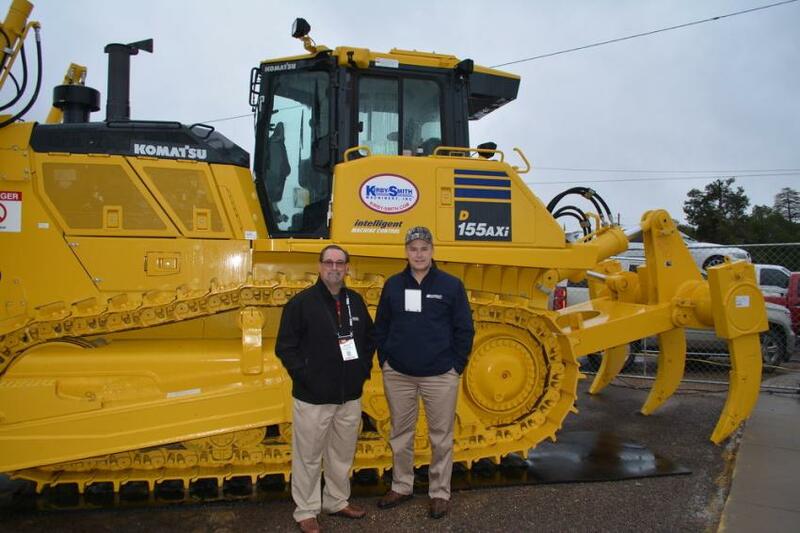 Chuck Thompson (L), West Texas area manager of Kirby-Smith, and Buck Lawson, senior district manager of Komatsu America Corporation, were available to explain the benefits of Komatsu’s D155AXi “intelligent” machine. 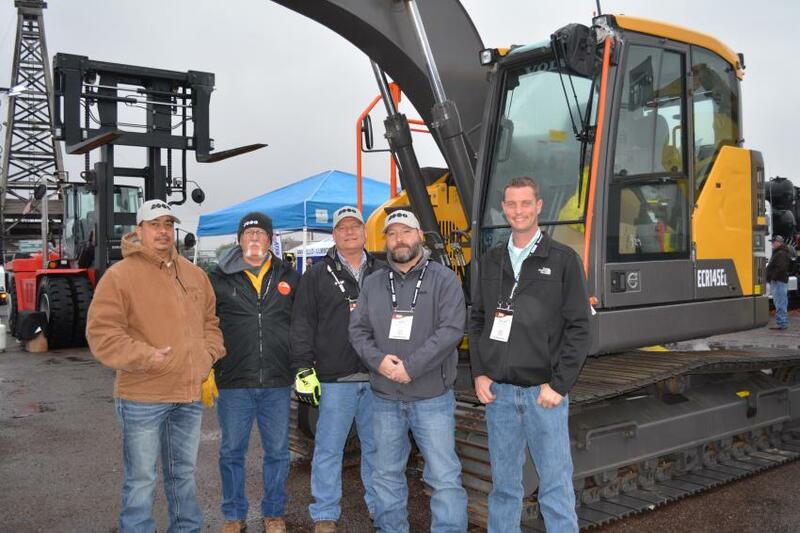 Representatives of ASCO Equipment were on hand to promote their full line of Volvo construction equipment. (L-R) are Victor Loya, Jimbo Fine, Mike Pallet, Nick Van Cleave and Shelby Whitley, all of the Midland and Odessa ASCO branches. 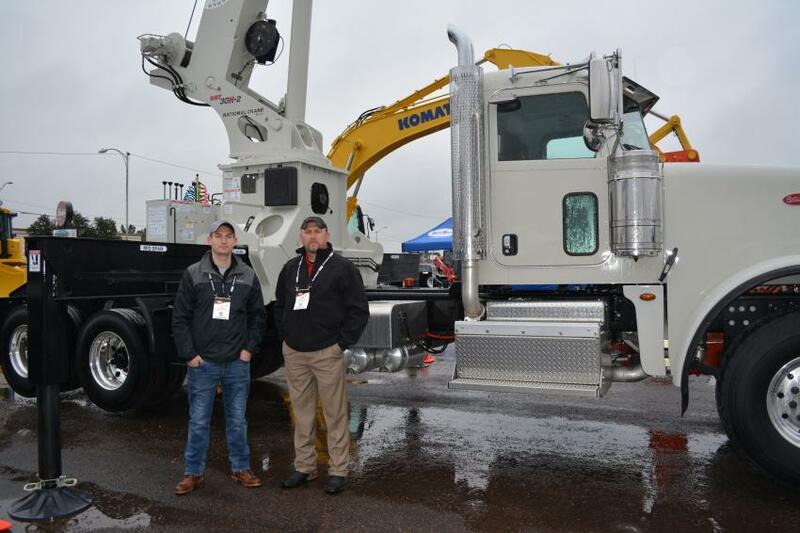 National Crane’s new tractor-mount crane, the NBT30H-2, was introduced to the oil industry by Kirby-Smith Machinery, National’s dealer in the Permian Basin. The crane offers full 360-degree stability with or without a trailer attached. JC Hoffman (L), senior engineer of Manitowoc, and John Arterberry, Kirby-Smith’s National Crane manager, were available to answer potential buyers’ questions. 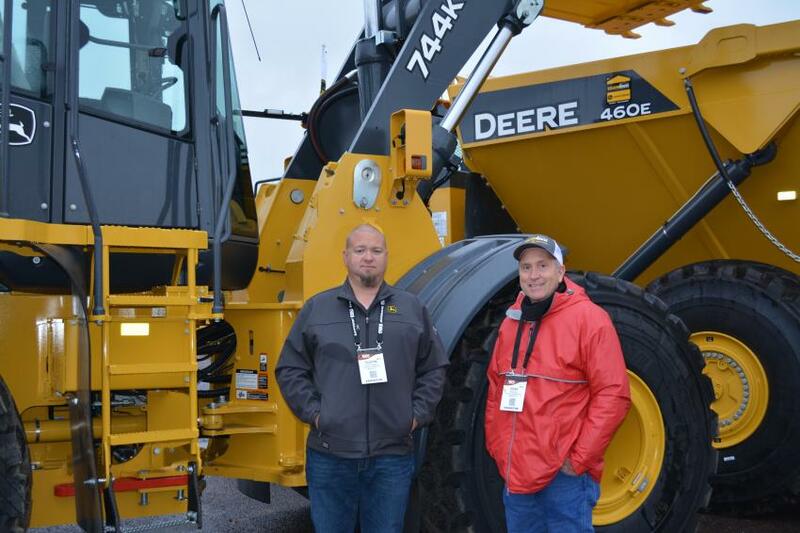 Dean Key (R), product support manager of Yellowhouse Machinery Company, and Dustin Cappers, customer service advisor of the Midland branch, highlighted the advantages of the John Deere 744K loader and 460E articulated dump truck for use in the oilfield. 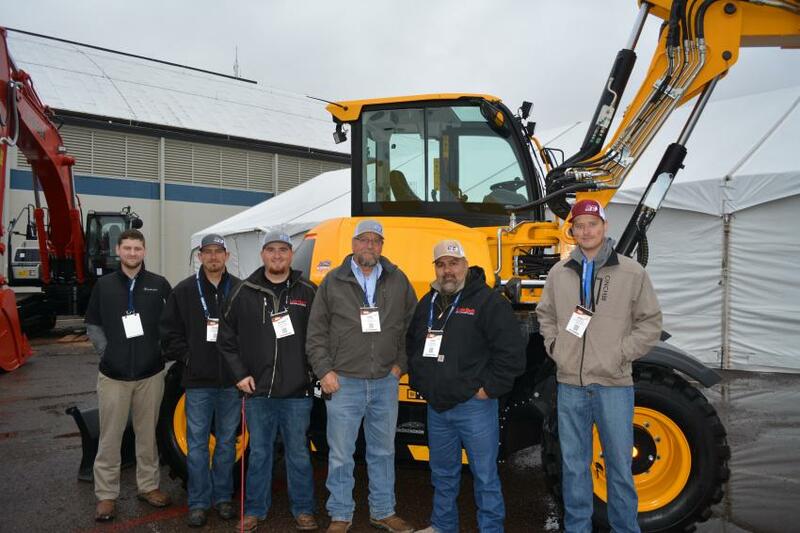 (L-R): Stuart Fox, Blaine Maturin, Jeremy Foster, Kirk Daniel, Kent Rivas and Jared Wilhoit, all of Cisco Equipment’s Odessa branch, endured the cold, wet weather to answer customers’ questions. Shown is JCB’s Hydradig 110W. Case Construction Equipment is represented in parts of the Permian Basin by Permian Tractor Company. 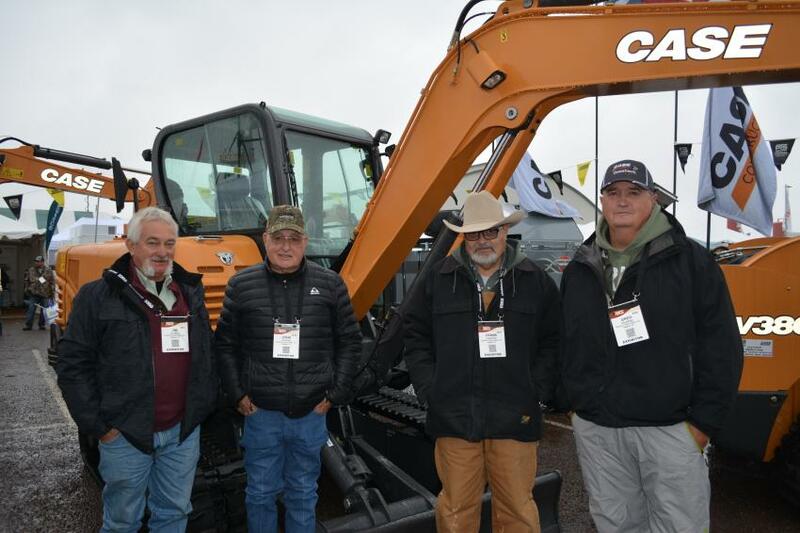 Representatives at the show are (L-R): Jim Miller, John Kelly (dealer principal), Frank Miller and Greg Miller. CraneWorks, of Houston, Texas, brought its line of lifting solutions to display at PBIOS. 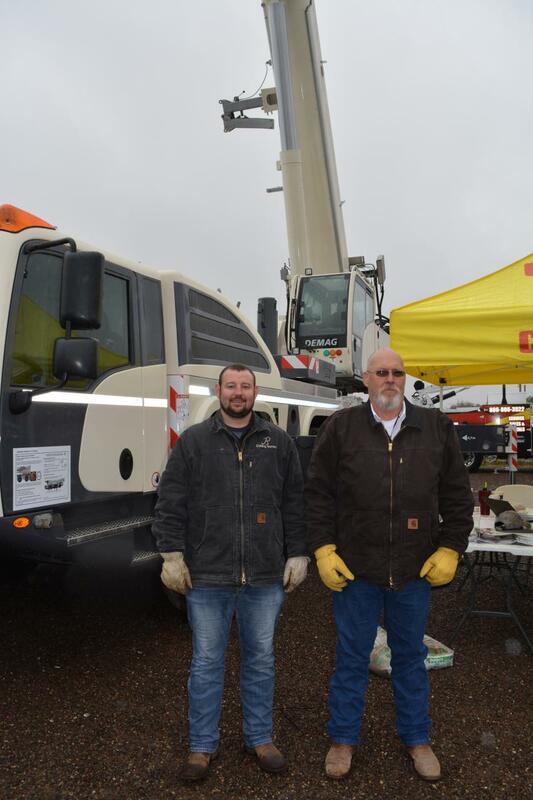 Kyle Cooper (L) and Charles Norwood manned the booth for the company which sells Terex and Demag cranes as well as a full line of complementary equipment for use in the oilfield. 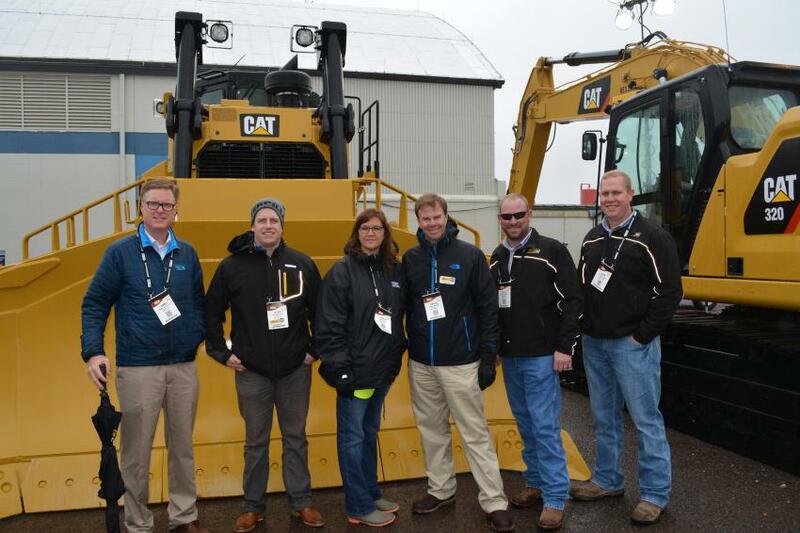 Warren Cat’s line of equipment was on display throughout the three-day show. The large contingent of Warren personnel on hand included (L-R): Tommy Reynolds, vice president of machine sales and rentals; Alex Nelson, strategic business analyst; Sandy Fox, marketing development specialist; Craig Brown, vice president of marketing, strategy and technology; Brian Hutcheson, machine sales representative; and John Bahlman, machine sales representative.